It is said the U.S. Silver Certificate was created so everyone across the vast stretches of America could experience breathtaking detail and appreciate great artwork. When it comes to media for public spaces we like to think of the silver certificate. Captivate your visitor first with an impression that says: "hello, I am beautiful and glamorous and have spent significant effort to attract your attention". Think of smART Media for Public Spaces™ as a nice bright welcome beacon that reflects the proud spirt of community. The embedded smART Code™ is like an invitation to ring your doorbell for social interaction with your unique local culture, history and geospatial features. Digital Deli Studios™ produces multimedia that plays on any device using Reactive Internet Multimedia™ delivered from Gen-3 Cloud™ for a complete on demand interactive solution. We can collaborate and consult on selecting artwork, media production and the right polished finish. When selecting Art for Public Spaces it is always the media theme first and then the message. We invite you to Contact Us to discuss smART Media for Public Spaces™ solutions. Art for Public Spaces projects can enjoy a wider range of curated content options from the Digital Deli Archive™. Since this is Art first and foremost, any typography proposed must be short and inspirational, enlightening or instructional in some creative manner that benefits the general public. The Creators of the Archive specified the finest art should be widely available for Public Spaces – kind of like the Silver Certificate. Tell us about your project, concept or vision. Describe the: mood, visual theme or overall effect desired; scale and scope of overall project; central point(s) of focus; typography, iconology, graphics; indoor, outdoor, harsh environment; reflective, translucent, backlit; digital image capture needs; vision for on demand interactive engagement. Explore sections below to learn more. The center cross road on the college campus will be renovated. The L shaped area (see rendering) needs fresh and bright custom art designed for permanent sheltered outdoor installation. A timeless theme needs to be developed for the 40 outdoor displays. Each department will prepare their inspirational quote for imprint. A smART Code array is a wonderful enhancement. The weather and scratch resistant finish is a perfect solution for our climate. Can you consult with the artistic director for media selection, the architect on the finish spec and IT for smART Code array. We'll need private online access for the Public Design Commissions final OK.Time Frame: ready now, complete by December 31. The new city center pavilion would like a (24) large format displays 12'x12' that have the mood and ambience of the Fairy Tale Gardens Collection. Could you put the visual theme together and ask the Curator to coordinate with our artistic director using the private gallery option to keep us all in tune with the project. No typography needed - just stunning art! The crews will be ready to install finished artwork after May 1st. Think about a winter theme for December. Ready to proceed. A public underground walkway will be opened spring of next year. The translucent Endura in the large thin LED lightboxes is an excellent suggestion for warming up the corridor to make it inviting. Need 48 displays each side for 96 total. Theme 1: Canadian Eastern Maritime (96). Theme 2: Fall foliage, mountains, stream, water, nature, sky, sun, wildlife (96). Propose two more theme sets so we may have a well balanced rotating gallery, neutral in theme and sure to please all, as recommended. Time Frame: start ASAP, installation March 1st. The Digital Deli Archive™ contains beautiful professional fine art display solutions in a fully indexed media library. Once the scope of your project is defined, concepts for display solutions quickly become reality, as advanced keyword hierarchy metadata is queried and provisioned, in private online multimedia galleries, keeping everyone in tune with the project. Your fastest pathway to an over the top creative artistic display solution will be through the Curator at the Digital Deli Archive™. Digital Deli Studios™ provides professional media production for all Digital Deli properties, brands and commercial media services. With direct access to raw image sensor capture data from the Digital Deli Archive™, digital negatives are produced with color and resolution prescriptions matching exact requirements. No more awful casts or fuzzy rezzed up media, just breathtaking hyper–realistic consistent results across all display mediums (photographic, digital display, projection). Leave your worries behind with eye popping, color matched, artistic displays and visual themes – custom made to exact size and on any substrate. Experience unparalleled quality and a wow factor that will knock your audience over with breathtaking detail, vibrance and clarity. All aspects of customization (size, substrate, finish, illustration, typography, graphics) are managed under one roof. No more guessing or hoping, just your exact specification, exactly the way you want. Once you have selected stunning photographic fine art displays for your design theme, it is time to set it off with an equally impressive presentation. Printed media may be produced on a wide variety of reflective and backlit photographic papers, fine art papers, fabric, canvas, latex, wallpaper, aluminum, glass, wood and carpet. Visual and spatial fine art displays may be produced virtually any size to meet exacting specifications. The Digital Deli’s Print Direct Worldwide Service can supply any type of finished interior display solution to meet design requirements – printed on demand and fulfilled anywhere in the world. Please visit Print Direct Worldwide to learn more. Digital Deli’s Next Generation On Demand Interactive Engagement places interactive content at your visitor’s fingertips from their Smartphone or Internet connected device. This is the smART way to cater to your visitor’s craving for more information. Beautiful artistic works from the Digital Deli Archive™ utilizing smART Code™ technology create impressive, interactive and highly persuasive engagements. Captivate your audience with an over-the-top first impression. Step into the Future of Media Now with Visual & Spatial Solutions that come to life in an irresistable manner to quench your audiences thirst for more information. Next generation IoT (Internet of Things) and M2M (Machine to Machine) communications can now be embedded into your custom displays for seamless on demand interactive engagement. A beautifully crafted art display transmits a building directory; an on demand virtual wildlife biologist explains an exhibit display; the model for a brand invites Interaction on demand for instant reward; Public Displays become digital portals with up to date pertinent information that may change daily, weekly or however you need. The embedded smART Code™ is like an invitation to ring your doorbell for social interaction with your unique local culture, history and geospatial features. When you answer the door, keep in mind the silver certificate. Another drone aerial, static website or social media link may not quench your visitors thirst. Digital Deli Studios™ produces multimedia that plays on any device using Reactive Internet Multimedia™ delivered from Gen-3 Cloud™ for a complete on demand interactive solution. smART Codes™ provide end–to–end extended interactive engagement, machine–to–machine (M2M), with no technical configuration for you to worry about. Your visitor accesses the embedded smART Code and your message renders (plays) on their Internet connected device. Digital Deli Studios™ can create, produce and deliver virtually any type of extended content. 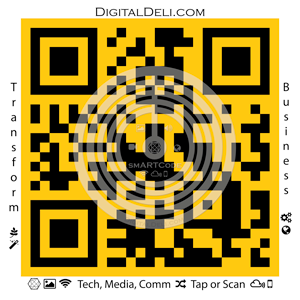 smART Codes™ are a BITT Pipeline Certified end–to–end solution from the Digital Deli Business Innovation Think Tank (BITT). smART Codes™ require no power, can retain data for 200 years, handle 1 million erase / write operations and employ 128bit AES authentication. A fully integrated commercial Digital Media Solution for any organization wishing to leverage 21st century technology. Digital Deli Global Media and Communications is an enterprise class multimedia infrastructure with many spokes attached to it’s core. 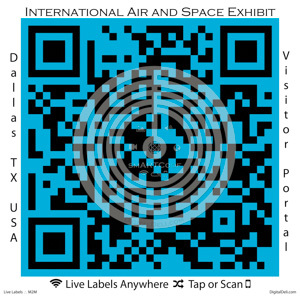 Print Direct Worldwide™ delivers professional industrial scale fulfillment 24/7 so you can rest easy for your global rollout, ad campaign, event, exhibit, interior design or public art display. smART Code™ technology enables multimode communications that rewards with interactive engagement for knowledge transfer using the Digital Deli's ICTS (information, communications, technology, security) pure digital pipeline. Digital Deli Reactive Internet Multimedia technology renders (plays) virtually any type of content, on any device, at any commercially available resolution and color space. The Digital Deli Cloud leverages massively large computer pods to provide load balancing, redundancy and global elasticity. Security is paramount and the Internet is a series of tollbooths we have learned to navigate. Providing a complete end to end solution: curated content, finished media, transcoding, elastic cloud instances, reserve capacity, global edge connectivity, near field communication programming, Reactive Internet Multimedia rendering engine technology – removes complexity and lets you focus on business requirements. We are in the Digital Age and of course you may want to embellish your visual and spatial theme with an over–the–top experience. Waiting rooms, lobbies, cafeterias, time out meditation rooms can be transformed to extend your chosen theme and suit your chosen mood. Digital Deli TV provides subscription access to curated content libraries from the Digital Deli Archive. Digital Deli’s Global Media and Communications operation delivers UltraHD smART Media content to networked digital multimedia displays, digital cinema and large venue projection systems. We have the talent to capture your vision and a significant arsenal of technologies, tools and techniques that can place you on a world class stage. We invite you to Contact Us to discuss your media for public spaces requirements.